For those of you who may not be familiar with this technique, here's a quick tutorial. 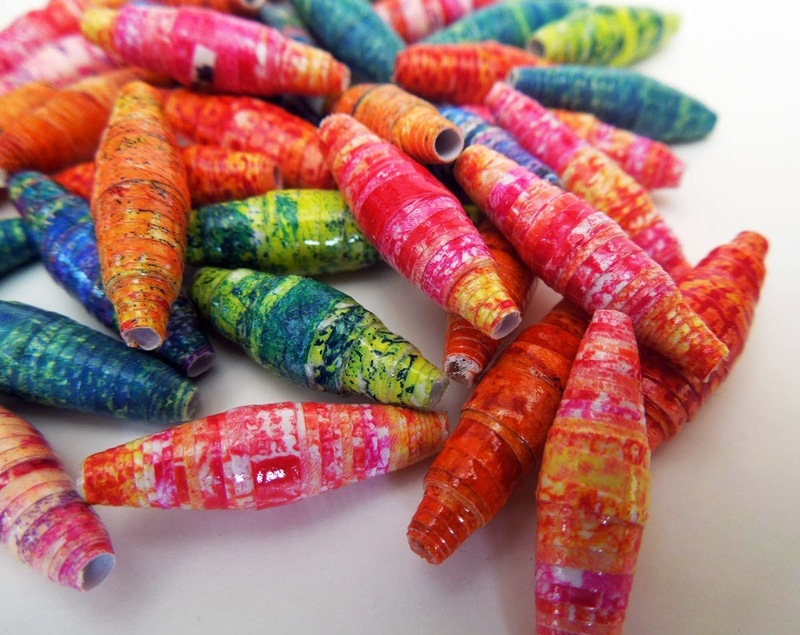 Making paper beads is super easy! 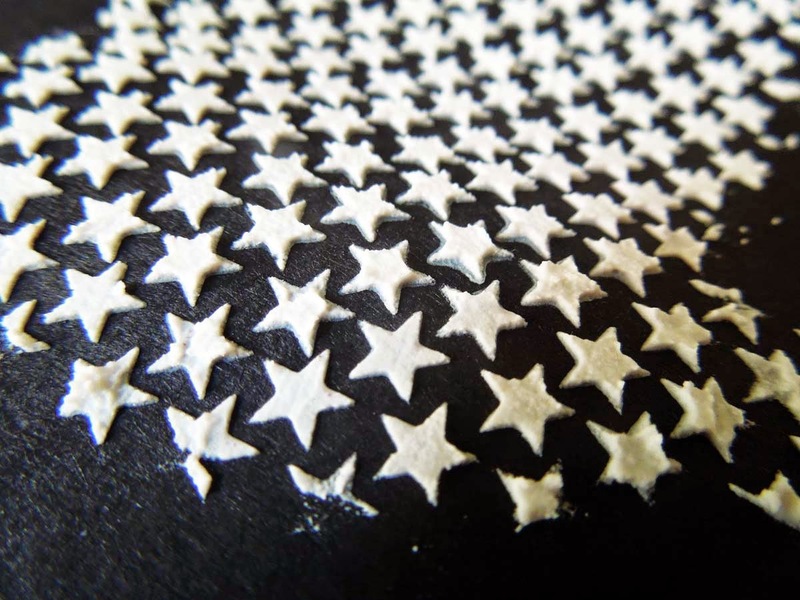 All you need is a sheet of patterned paper, some toothpicks or matches, some glue and optionally a paper trimmer and glazing medium. First, cut your paper into long triangles, approx 1" wide (or a little less) at he widest point. This is very quick and easy if you use a paper trimmer, but you can just use a pair of scissors too. 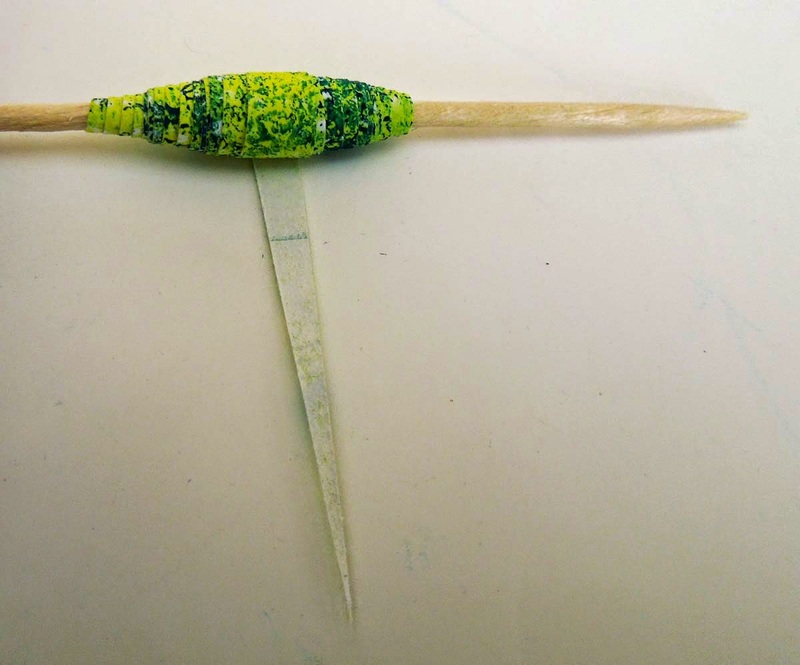 Next, roll your paper pieces on a toothpick starting at the widest part, making sure that the tail end stays in the middle and doesn't go off course, otherwise your beads will be wonky. Use some glue or gloss gel medium to secure the tail end. 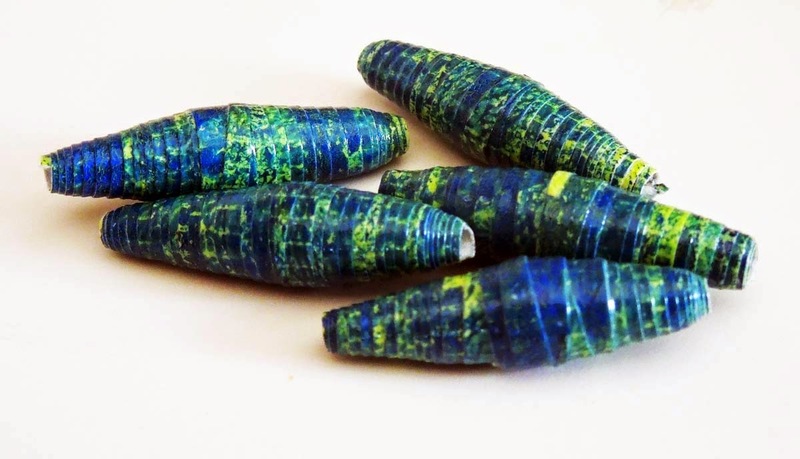 I also like to coat the whole bead with the glue, so the layers don't move on top of each other. Let it dry for an hour or so. 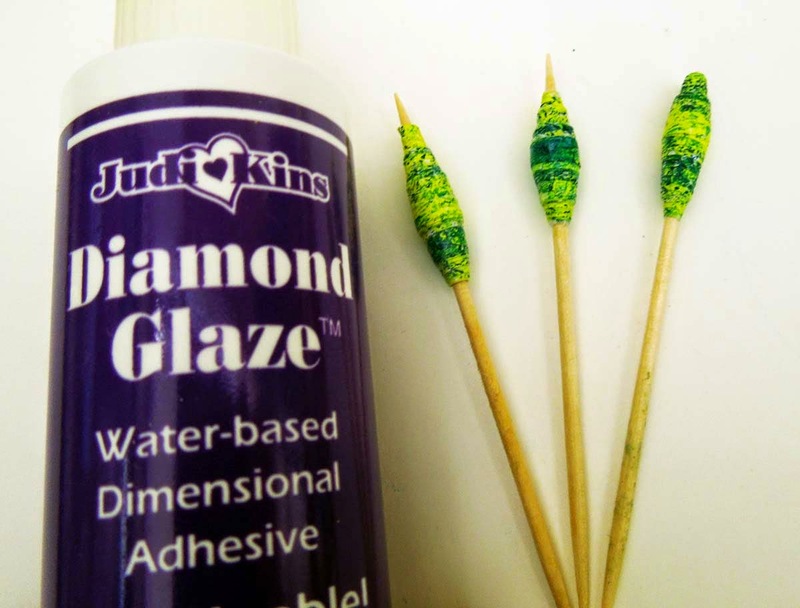 When it is completely dry, use some kind of glossy glue or varnish to make the beads nice and shiny. I used Diamond Glaze, but Glossy Accents will work just as well. Tip: use a piece of Styrofoam to secure your toothpicks in an upright position while the beads are drying. 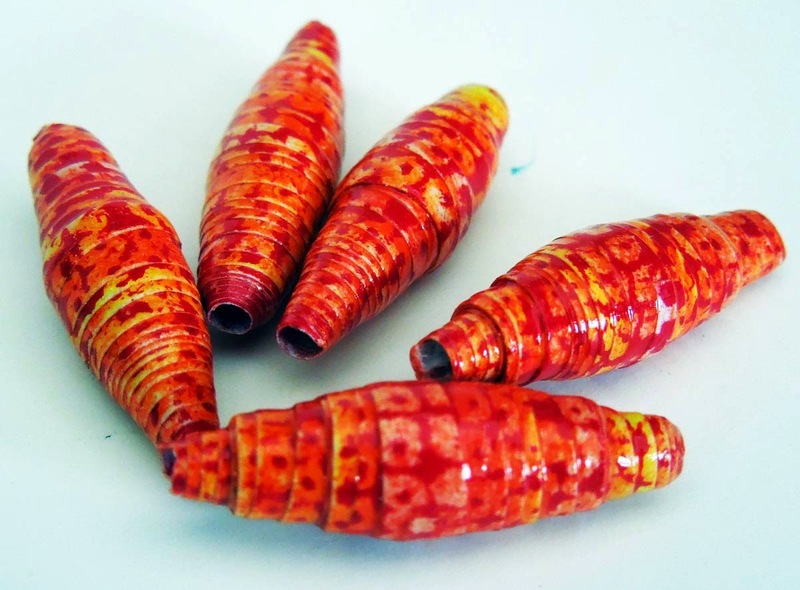 Tip2: If you find the beads stuck to the toothpicks when you want to remove them, try twisting them gently. They should come undone. 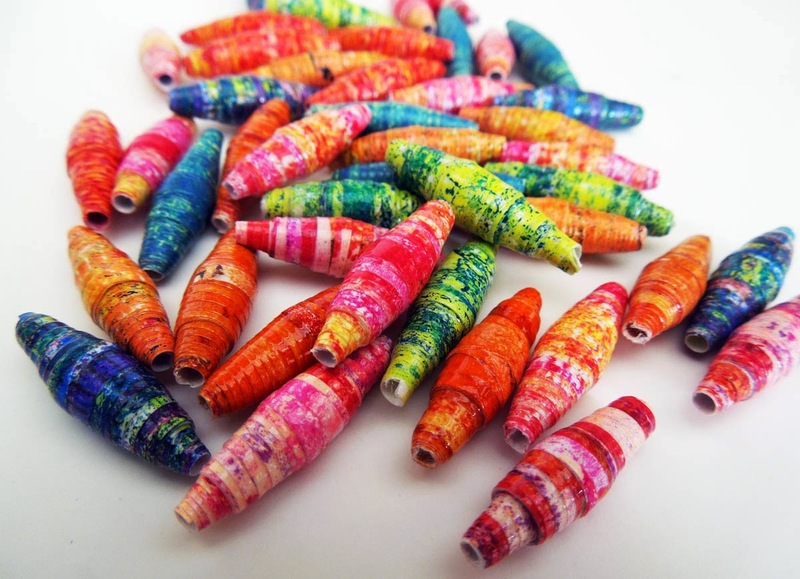 You can use paper beads to make jewellery and all sorts of decorations for your cards, tags and journals. Have fun making your own! 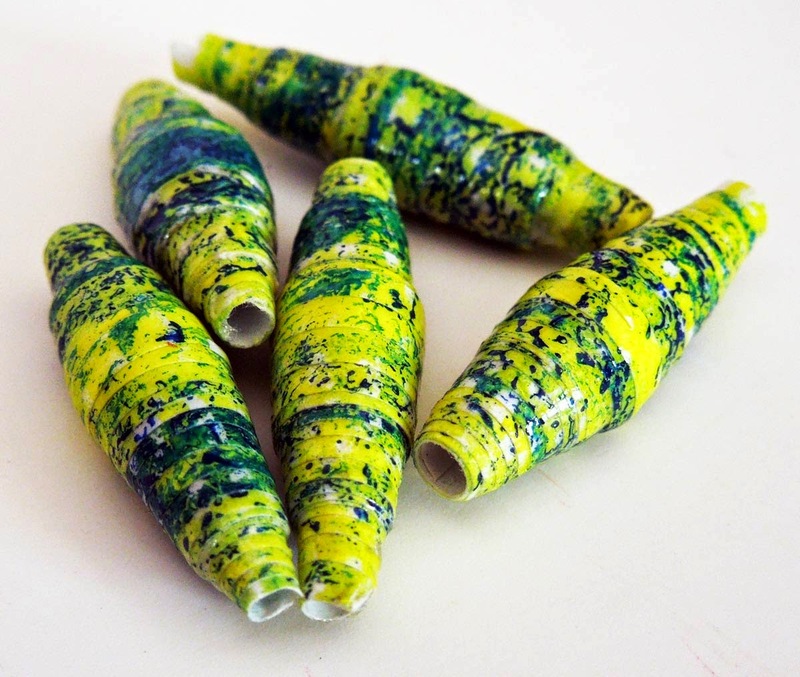 If you would like to see a video of how to make paper beads, check out this tutorial that my crafty friend +Anikó Dóbiász uploaded to YouTube. 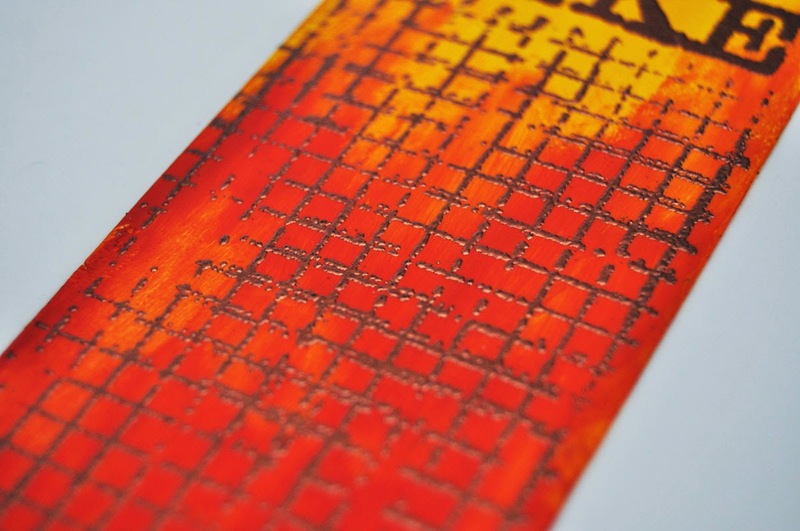 Wednesday has arrived, so it's time for another desk hop over on The Stamping Ground! My work surface is still clear from my weekend clean up. We had guests, so I had no other choice but to pile everything into boxes, which are now scattered around the house. As you can imagine, I can't find anything, which is very frustrating! I did manage to excavate a few bits and pieces though to do some experiments. 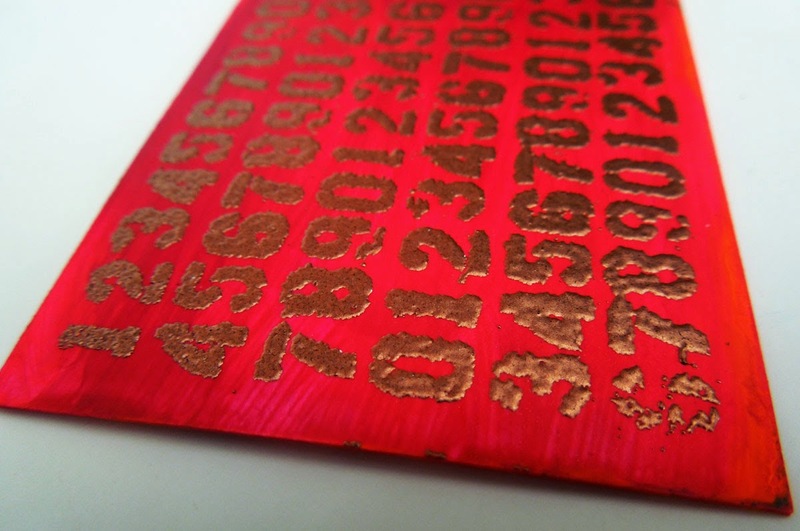 Modelling paste always manages to seep under my stencils, no matter how careful I am using it. This never happens with Polyfilla as it is a lot denser. The patterns are always crisp and well defined. When I use wet media on top of modelling paste it tends to go soft again. 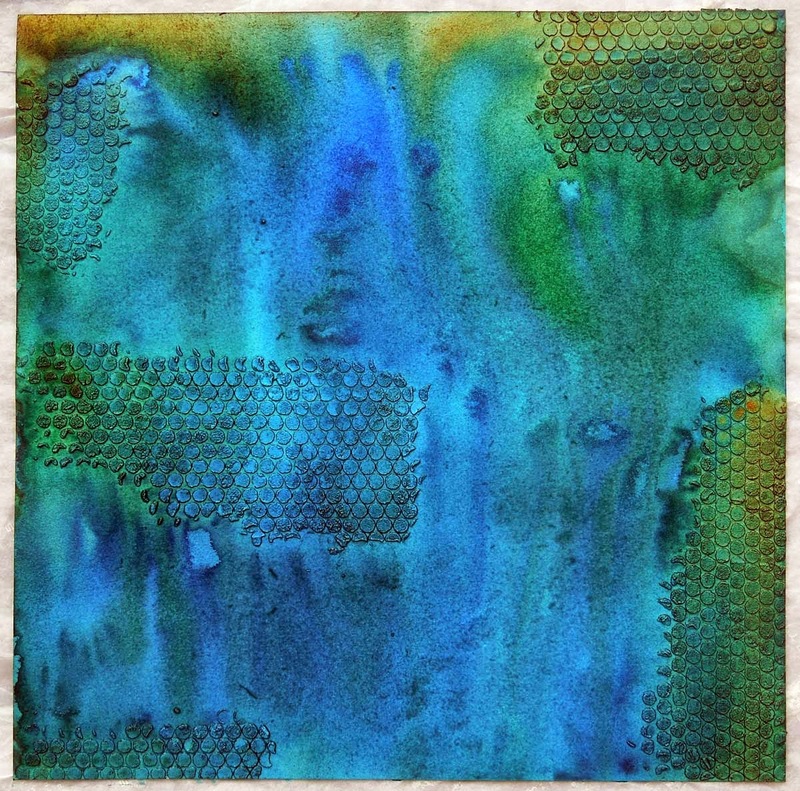 The other day I used spray inks and my texture went mushy and eroded completely. Once it's dry, you can put your polyfilla textures under the tap if you want, it will still hold strong ! Polyfilla is quite gritty, and I prefer that to the smoothness of the modelling paste. Polyfilla is much cheaper than any modelling paste. You can get it from DIY stores or online from Amazon. But don't take my word for it! Take a look at my results below. 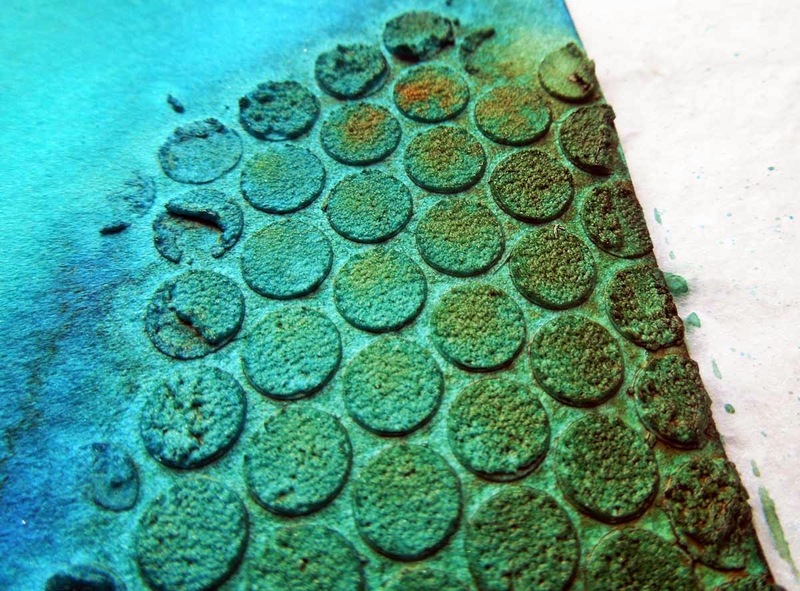 I used regular black cardstock and some pieces of punchinella (sequin waste) to create these textures with both Polyfilla and a modelling paste to demonstrate the differences. I think the results speak for themselves! I realize that not all modelling pastes were created equal, but Polyfilla works so well, I don't need to experiment any further with anything else. It suits my purposes perfectly for now. 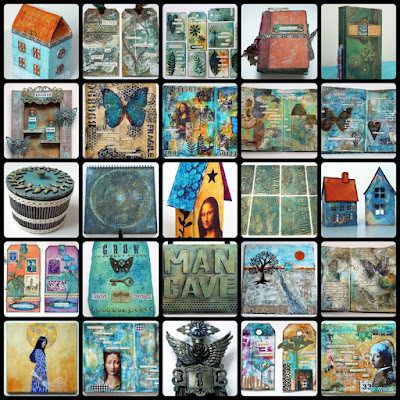 If you would like to see some of my completed projects where I used Polyfilla textures please check these links: Mixed Media Birthday Card and Mixed Media Scrapbook Layout. It's my son's 10th birthday today. To mark this milestone event, I created a giant birthday card for him out of reused Amazon packaging. You know the large fold-over ones they use for sending out books? It's just just the perfect size for this project. 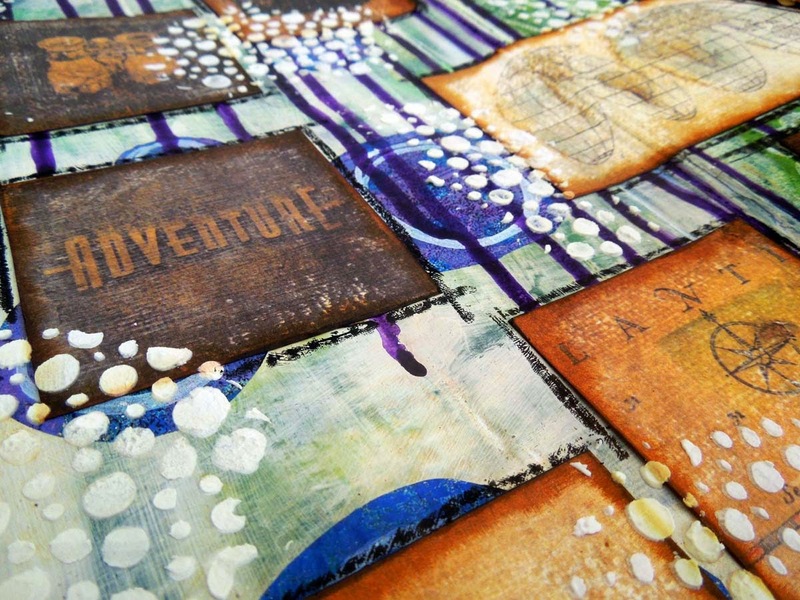 It's not only a birthday card but also an art journal-type layout and a scrapbook all rolled into one! I started out by laying down a thick coat of gesso all over the packaging. 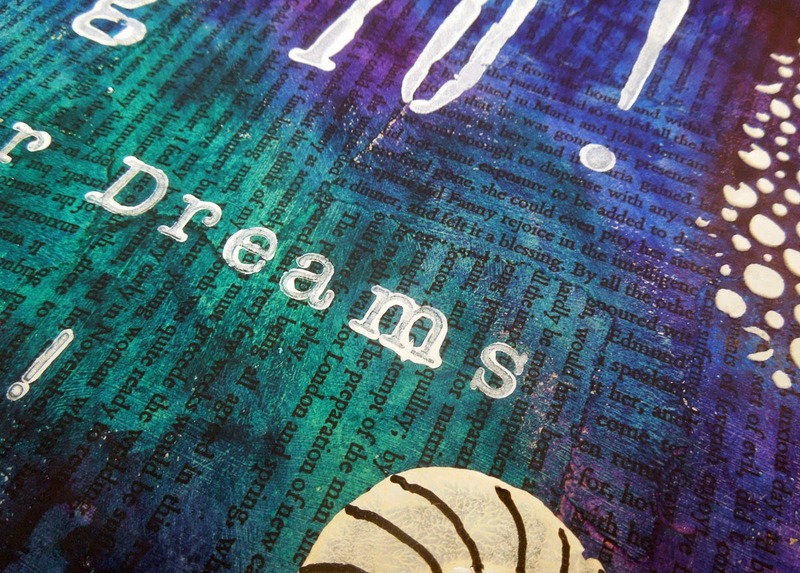 On the inside pages and flaps I used a mixture of gelli-print collage and acrylic paints for the background. 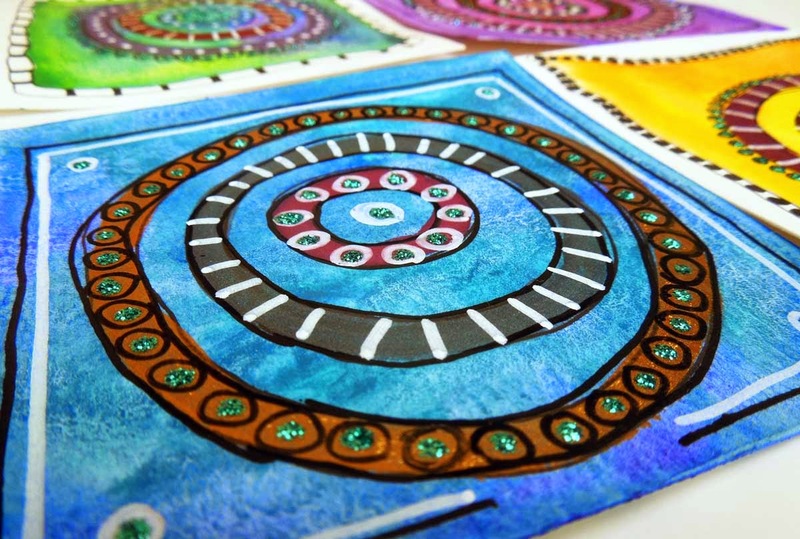 On the outer side of the three flaps I used ink soaked scrap paper towels from my previous projects. I really like the type of textured surface it created. 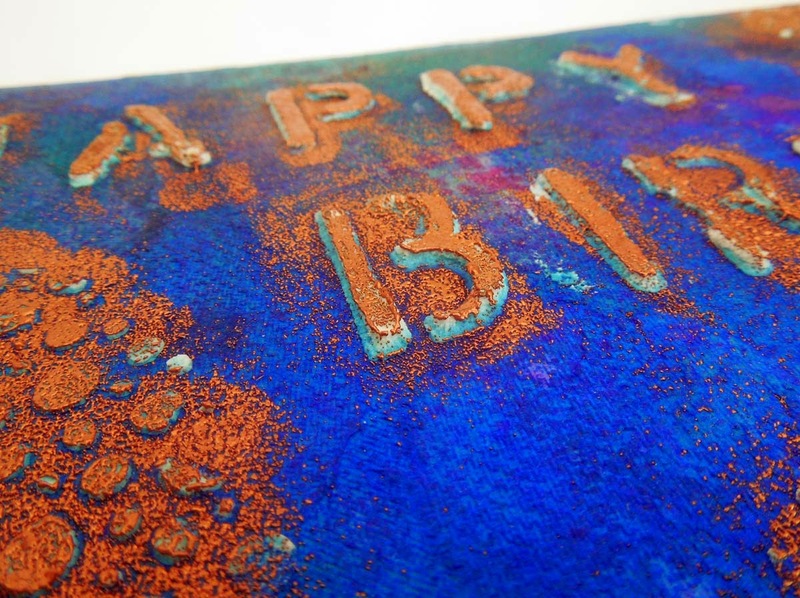 On the front flap I stenciled 'Happy Birthday' with texture paste and heat embossed it with copper. With hindsight, I wish I had left it just white because it would have suited the project better. 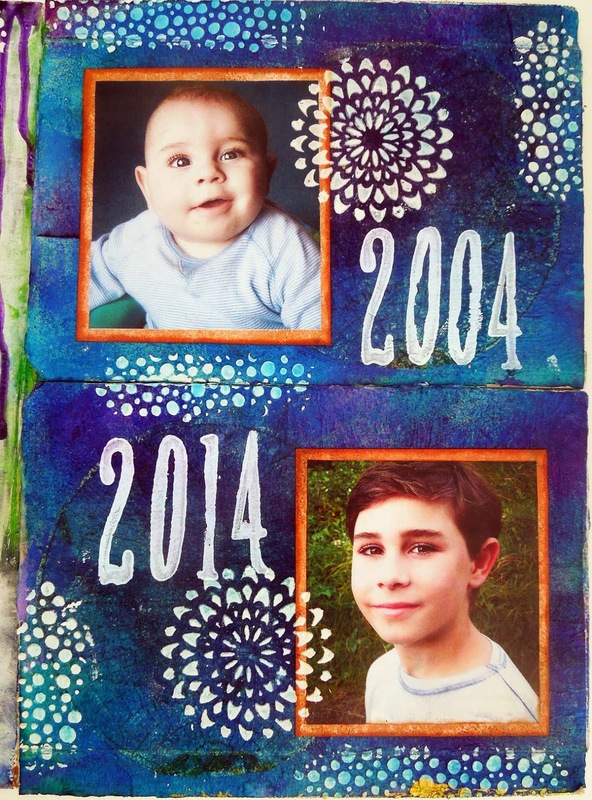 On the outside of the other two flaps I placed a photo of my son as a baby in 2004 and another photo that was taken just a few weeks ago. It's fun to see the two photos side by side, then and now. 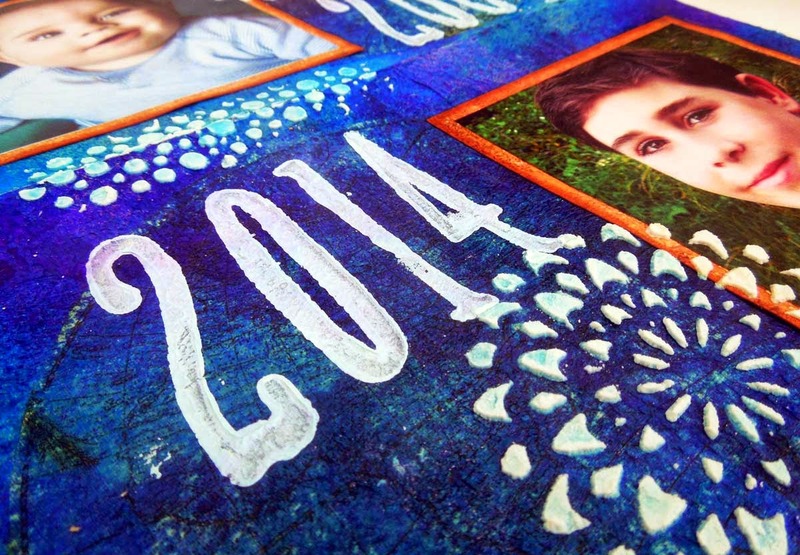 I used some stenciling with texture paste and stamping with acrylics as decoration. 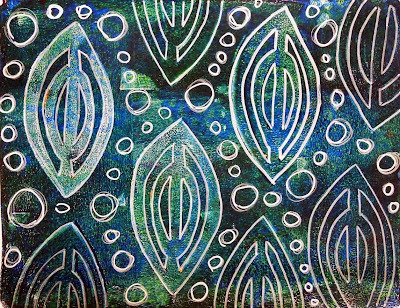 The texture paste picked up some of the ink from the background, which is not a bad thing at all. 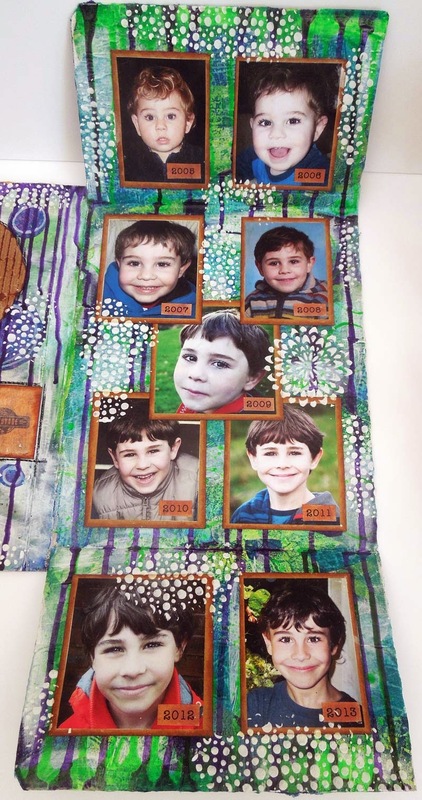 The flaps open up to reveal several more photos of my son - one for each year between 2005 and 2013. It's nice to see the progression from toddler to a tweeny! Where will your balloon take you? 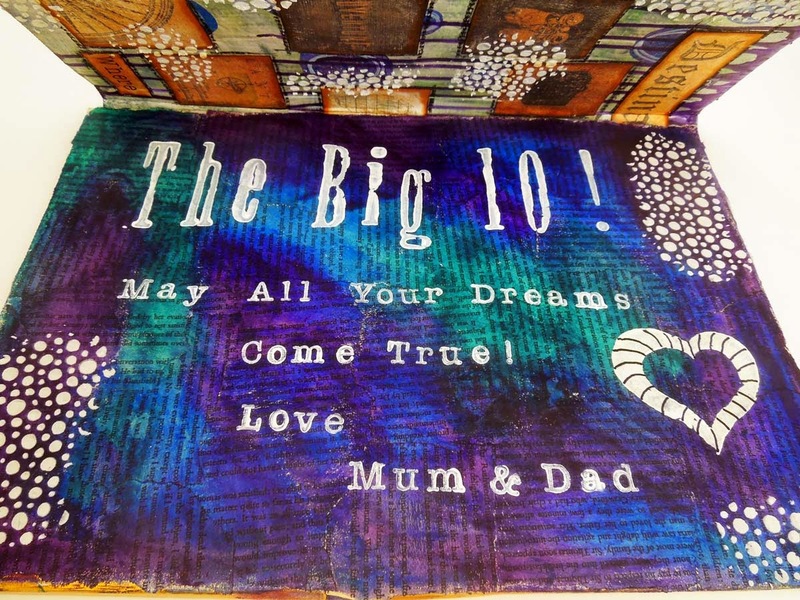 The project was completed with a birthday message on a collaged and painted background. 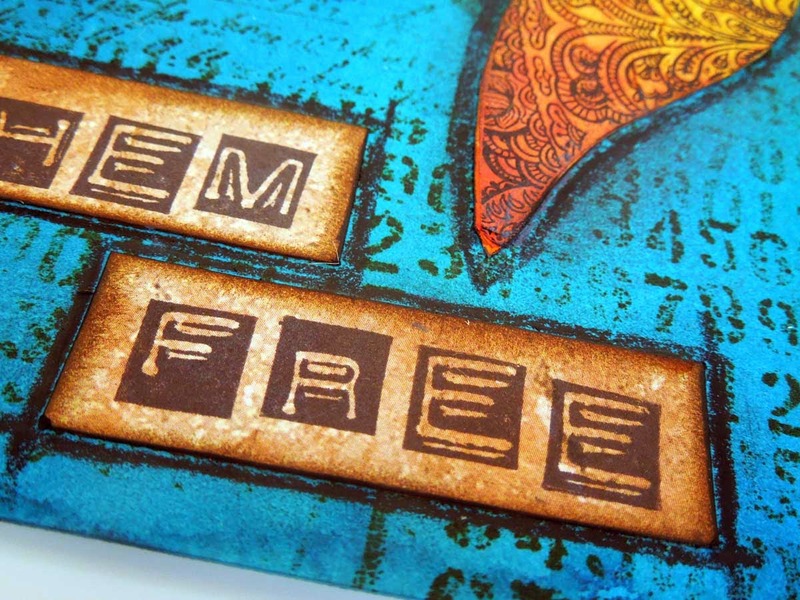 I used foam stamps, rubber stamps and stenciling as decoration. This was a monster of a project and took me three days to complete! 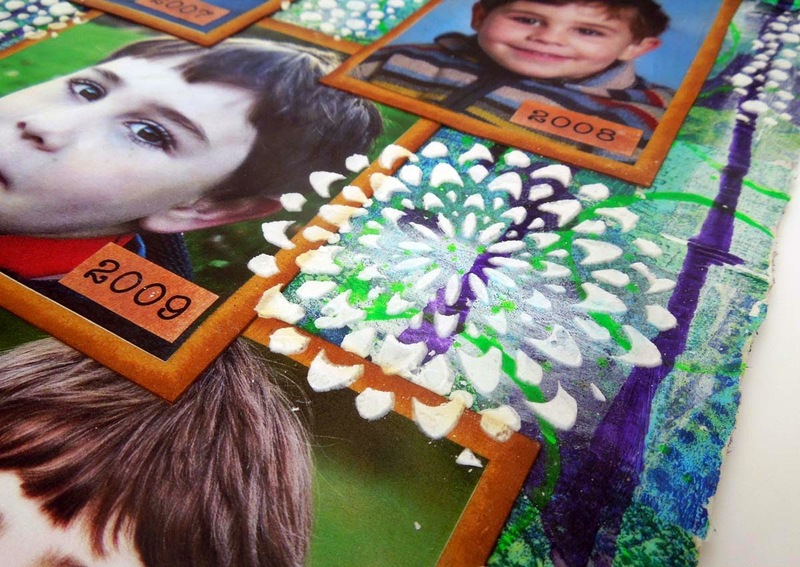 I've put my heart and soul in it and I think I managed to create a keepsake that my son will treasure for years to come commemorating a milestone birthday. The hardest part was to keep it hidden from him until the big day! Mission accomplished! Happy birthday kiddo! 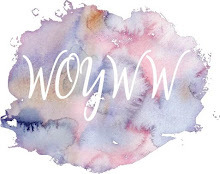 WOYWW 276: bit of a disaster! Hi, this is my first WOYWW post! 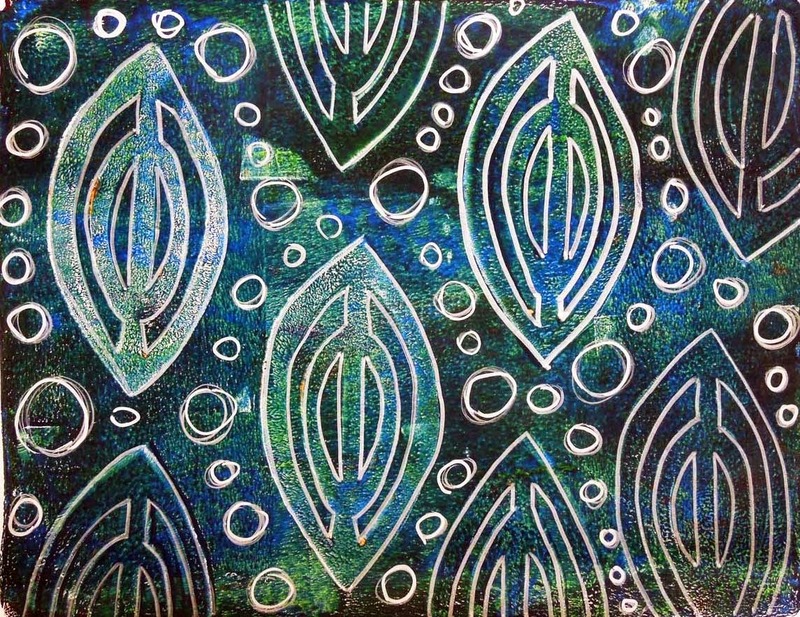 I've been snooping around The Stamping Ground for a while visiting other links but I've never posted one of my own. Why I decided to do this today of all days, I'll never know! Anyway, I bumped into The Stamping Ground earlier today and realised it's Wednesday today, so I thought why not? It's a shame that the project I'm working on at the moment is turning out to be a bit of a disaster, but we all learn from our mistakes, so here it is in all its "glory"! 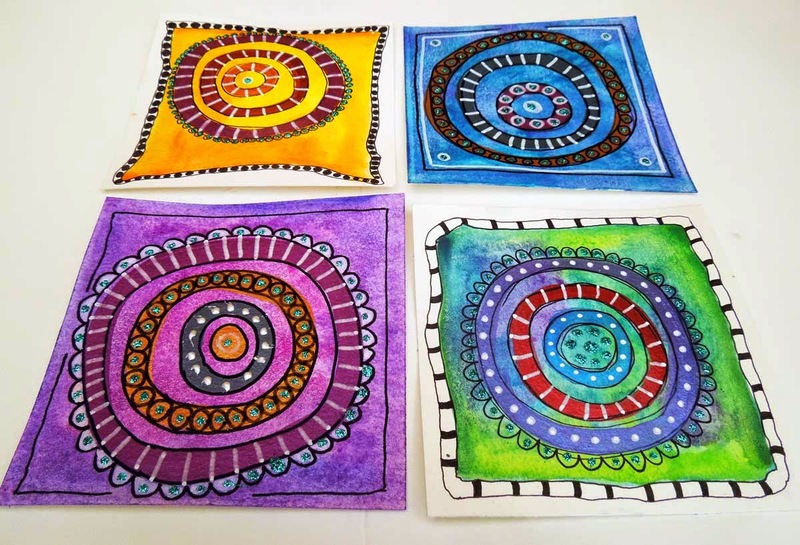 It all started last weekend when I watched a tutorial by Tamara Laporte of Willowing which she made available to her newsletter subscribers. I really liked her project and decided to create my own version of it. Somewhere along the line though (who knows why) I went completely off track and followed my own ideas. I'm not sure that was the right thing to do. Anyway, I've learned a few things from my mistakes, which now I'd like to share with you. 1. 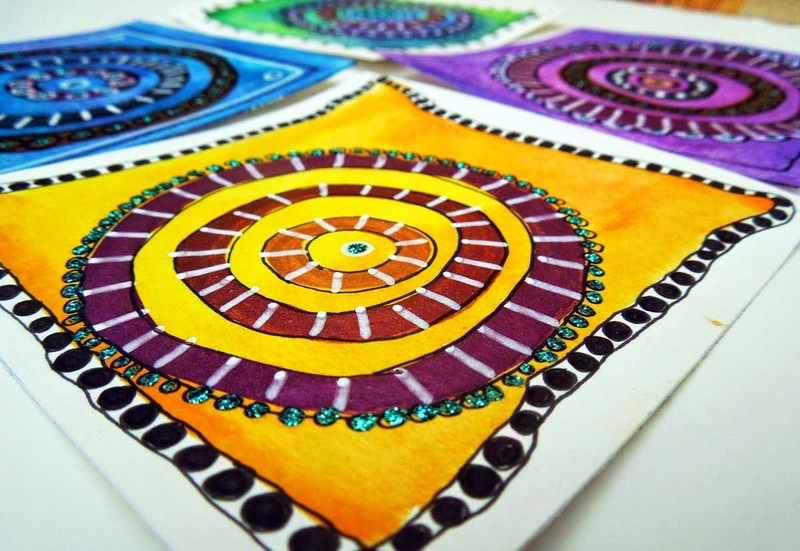 Using good quality watercolour paper allows you to wash off any water-based ink or watercolour paint. I even put my project under the tap several times (yep, you've heard it right!) and the paper remained completely intact. You may not get rid of all the pigments this way, but it certainly allows you to correct some minor mishaps or design faults. 2. Spray inks get everywhere! If you want to protect certain areas on your project, cover it up with a mask. 3. 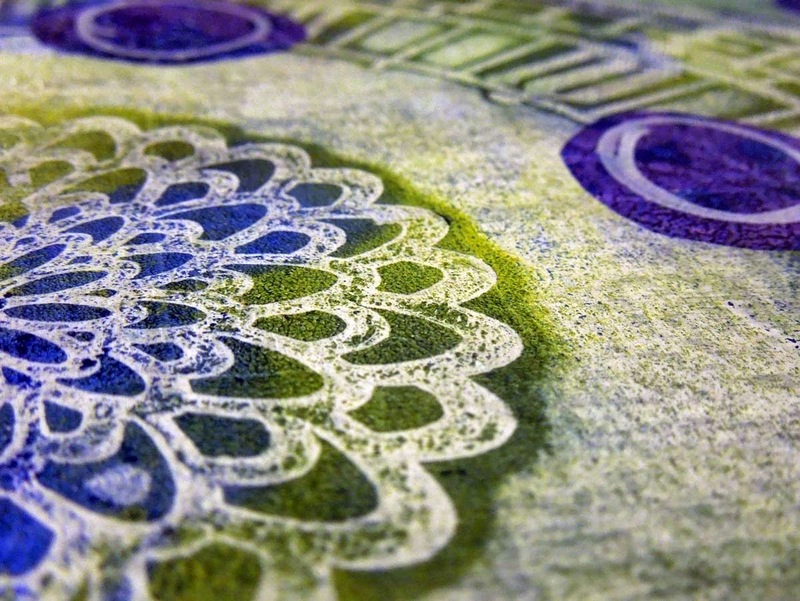 When using spray inks, choose colours that mix well with each other across the whole spectrum. For me pink, blue and turquoise worked quite well. 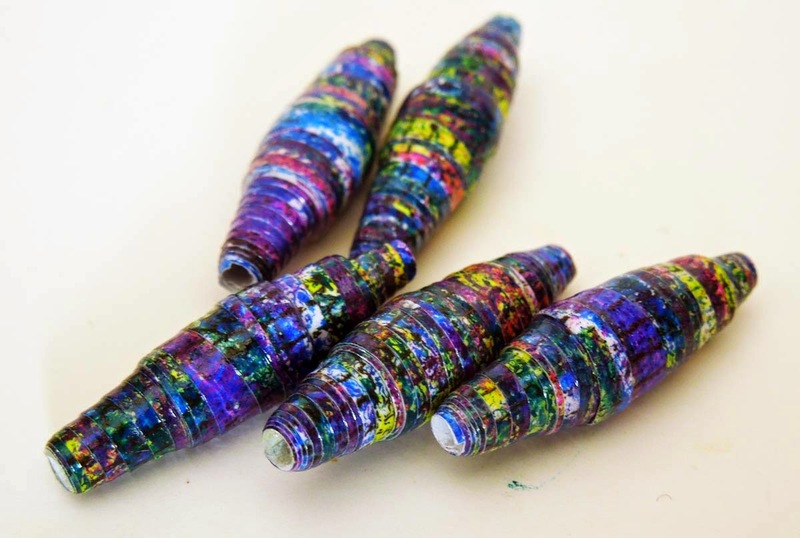 Originally I used some yellow too, which would go with all three individually but when mixed with the purple made by the pink and the blue, it turned an ugly brown. 4. Heat will melt and set the Portfolio oil pastels making them shiny, which may or may not be desirable. 5. Stabilo All pencils are great for outlining but only if you're looking for a smudgy outline. I'm pretty sure I've ruined this particular project with them as I can't do anything to it now without smudging it. 6. When following a tutorial, keep to the supply list and instructions as much as possible, otherwise there's no way of knowing what you end up with! Of course, this could work in your favour too - for me it didn't in this particular instance, lol! Anyway, here's my work desk (which also doubles up as our dining table). I really think I have to abandon this project for now. I might start it again from scratch some time in the future when I am more comfortable with drawing and shading faces as I quite like this idea for an art journal spread. I will call it "Follow your dreams". I hope to join future WOYWW link parties. Thanks for visiting my blog! Do look around a bit more while you're here. I'll visit you back if you leave a comment with your WOYWW number! Last night as I was reading with my son we realized that we didn't have any proper bookmarks to use. I offered him one of my art tiles for this purpose, but he thought they were "too girly" so I promised to make him some others that would be more appropriate for his gender and social status (i.e. "cool"). True to my word, by the time he came home from school today I greeted him with his very own set of personalized bookmarks. I didn't have much time to spend on this, so I had to find a quick way to create something suitably awesome for him. 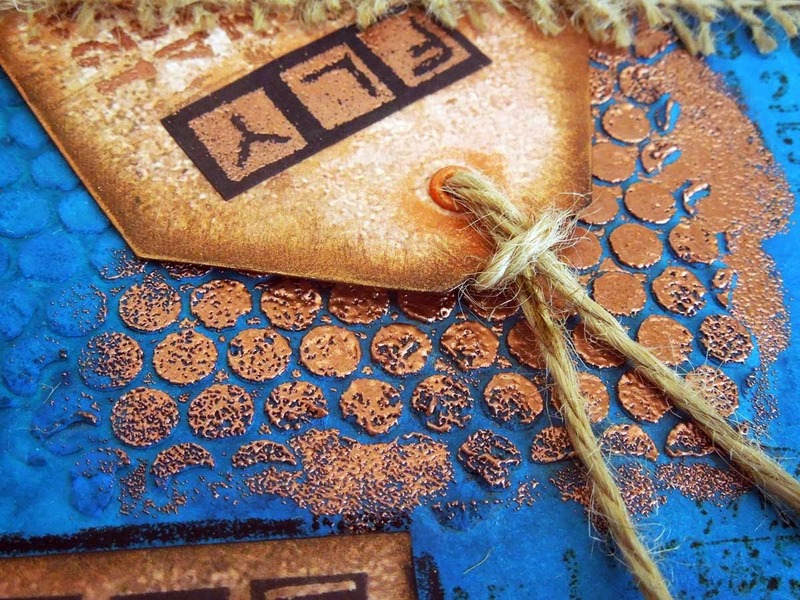 I remembered that he admired the tag in the scrapbook layout I had recently completed, so I decided to follow that pattern and use heat embossing as the main feature for the bookmarks. 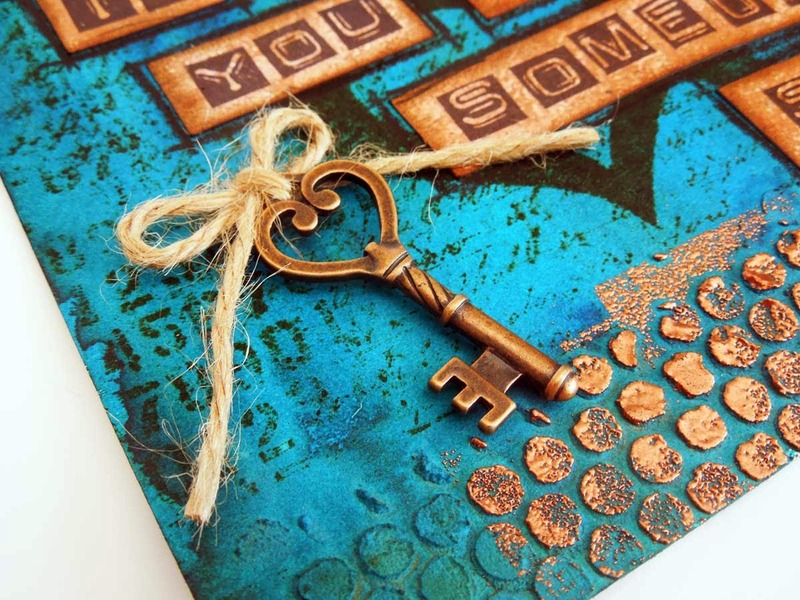 The purpose of the Blog Hop is to introduce fellow crafters to each other and share our passion for anything crafty by answering four simple questions. So here we go! So many things! However, sadly, some of them will never see the light of day. I have a confession to make: I'm a scanner. (No, not a spammer, or scammer! A scanner!) 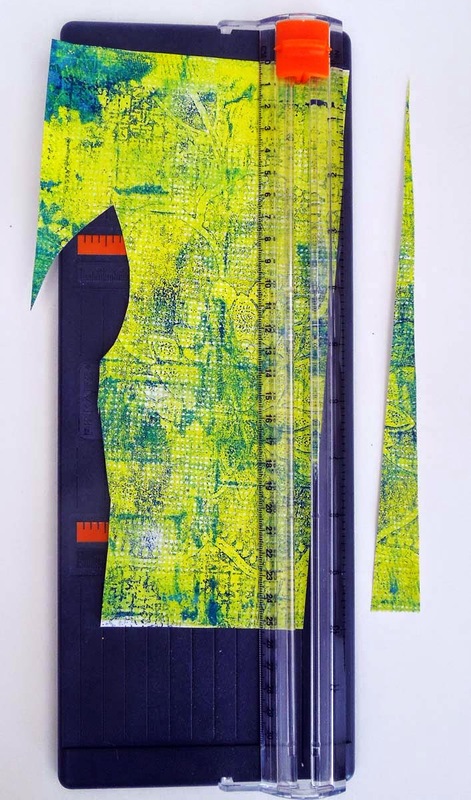 By definition, a scanner is someone who "has lots projects on the go, but seldom finishes any of them before they lose interest and move on to the next project." Yeah, that's me! I've got so many interests and ideas and such a long list of things to do that I find it overwhelming. Before I have a chance to sit down and complete a project, I might see a video, for example, which completely diverts my attention. Then I might see a blog post and think wow, and have to try that! But before I get a chance, I see yet another technique or project and completely forget about my previous plans. And nothing actually gets done! Being a scanner is not easy! For us scanners, the Internet is a double edged sword. On the one hand, it satisfies our thirst for information, but on the other hand, it completely distracts us to the point that we don't get anything done. I really have to work on this, I know! I do get some projects done though, but the reason I'm not very efficient, is because I find it hard to focus on just one thing. That's why I like challenges! I've found I can focus on challenges a lot more, especially if there's a deadline! I do have a few small projects in the making though. Let me share some of them with you here. I have loads of ideas and inspiration for future blog posts and projects, which include exploring and experimenting with various techniques, writing products reviews, creating colour charts, taking part in challenges, etc, etc. My mind is spinning just thinking about them! 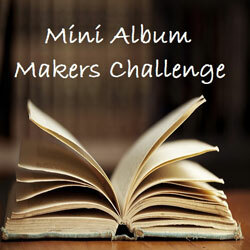 I also have an ambitious plan to start a second blog about photography and digital scrapbooking. 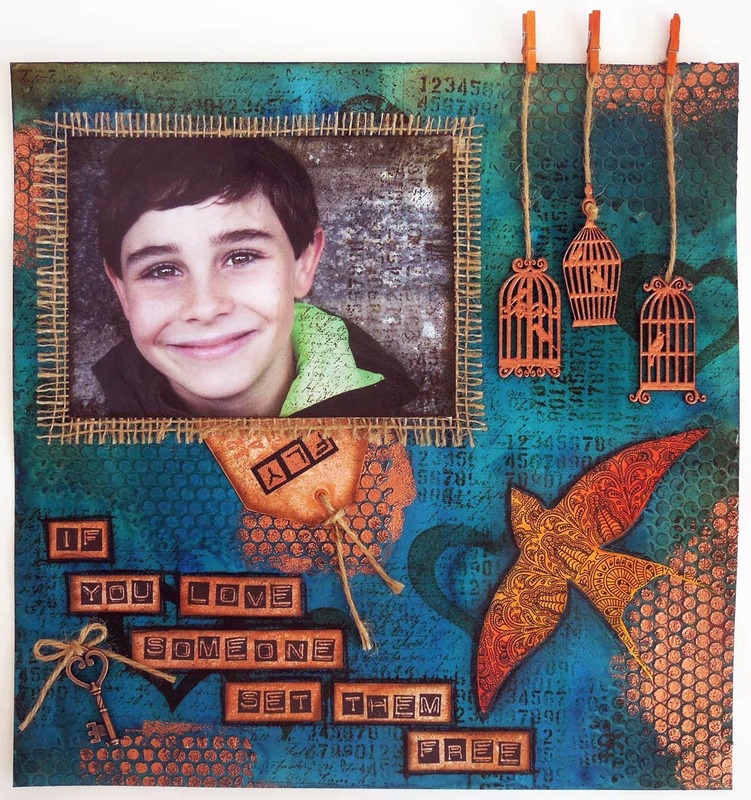 This would include digitizing my Gelli prints and mixed media backgrounds, and perhaps creating my own digital stamps and other page elements to offer as digital downloads. As you can see I've got LOADS of plans. Whether my scanner personality will allow me to complete any of these, remains to be seen! I'm not sure it does. Most of my inspiration comes from the Internet. I try not to copy entire projects, only borrow ideas and put my own spin on things, but I don't think anything I do is unique or exceptionally creative. I like to experiment though, and if I find something worth sharing, I do. But most of my experiments are triggered by something I see or read on the Internet, so they're hardly ground-breaking. Being creative doesn't come naturally to me. I wish I could say I was always arty and loved creating art from an early age, but that's not the case. I grew up in Hungary, which, as you may know, was part of the old Eastern European communist block. Creativity wasn't at all encouraged in that culture when I was a child. 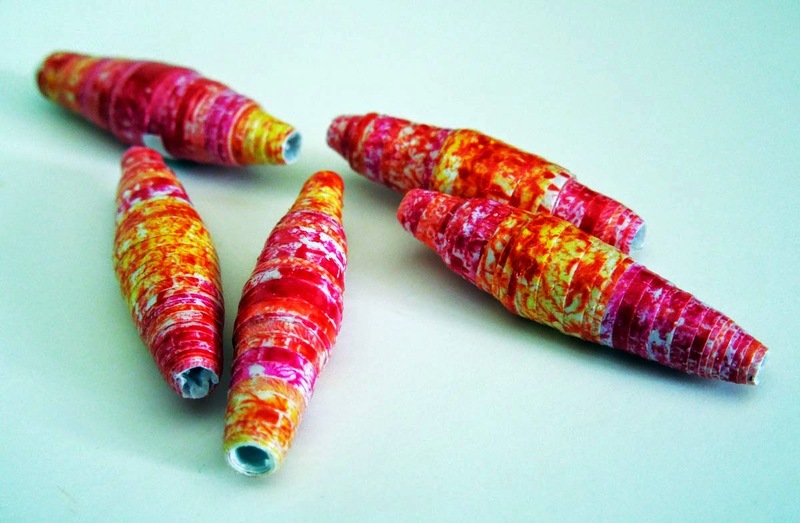 It wasn't until my mid 30's that I became interested in crafting. 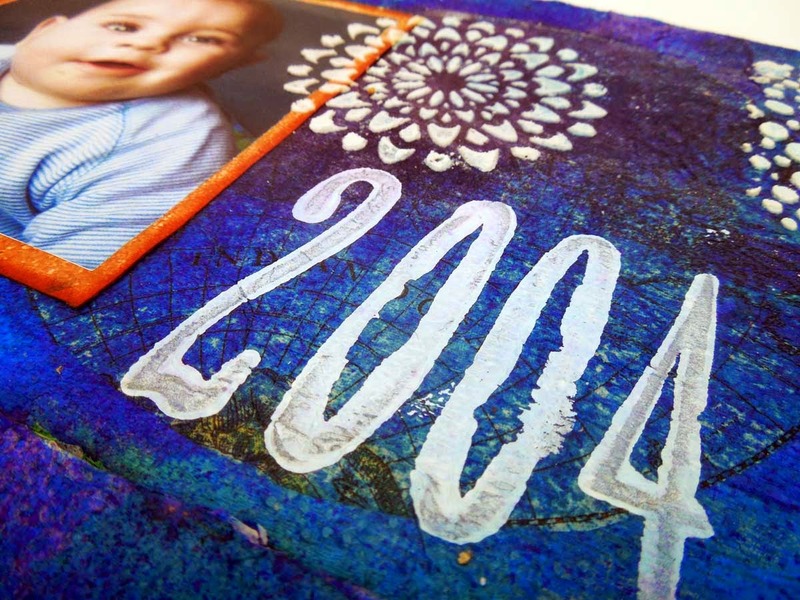 It all started with scrapbooking when my son was born and I wanted to find something to do with all those baby photos. A few years later I got frustrated with lack of space to store my supplies and went digital. I sold most of my tools and materials. Little did I know, that the crafting bug will come back and bite me with a vengeance! 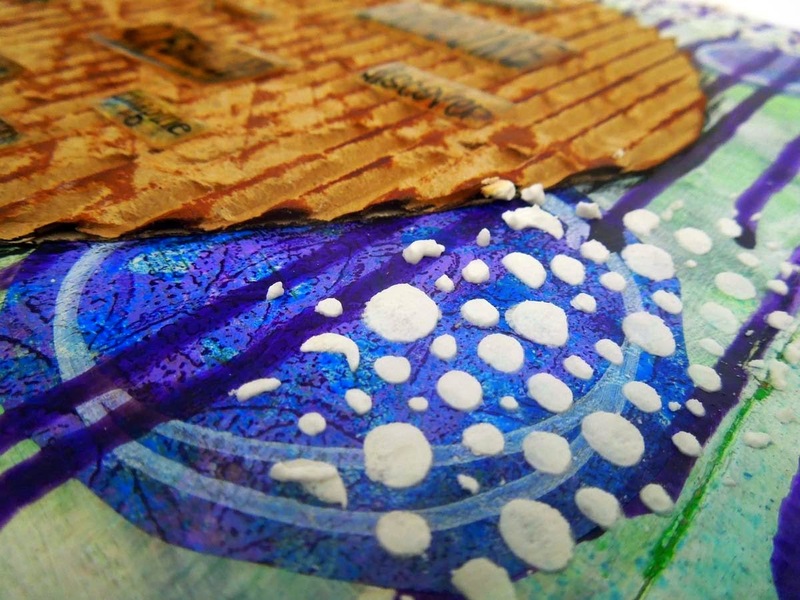 That happened when I discovered mixed-media not so long ago. I still suffer from lack of space, but this time the passion is so strong I can't fight it! Our dining table is now my craft table, which means I have to clear it every time we want to sit down for a family meal! My dream is to have my own studio, which hopefully will happen one day. Not a day too soon! The short answer to this question is that I create because I need to! It gives me a purpose and it makes me happy. I tend to get anxious and depressed from time to time (nothing serious though!) 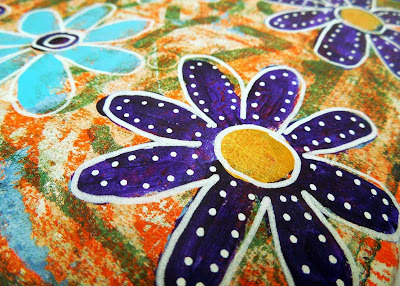 and doing something creative is like a miracle cure for me against anxiety and depression. I think it's very therapeutic. It should be prescribed by doctors instead of happy pills! It usually starts with an idea prompted by a video I watch, or a project I see on the Internet. Some of my projects come together quickly and easily, some others take longer and are more challenging for me. When I get stuck, I tend to leave it, perhaps do some housework and come back to it later with fresh ideas. This way, it might take me days to complete even a small project. I enjoy thinking about crafting as much as I enjoy doing it. In fact, sometimes I even wonder whether I enjoy thinking about it more than I like doing it, LOL! I know I definitely spend more time watching others create stuff than doing it myself! 2019 edit: I had to remove some of the links I had on this page as they were connected to G+ profiles, which Google killed off in February 2019. As a result, I also lost ALL my comments between 2014-2019. Thanks Google, good thing you were pushing G+ back when I was starting out. The decent thing would have been to help us migrate the comments, but I guess it was easier for you to just drop the entire project. 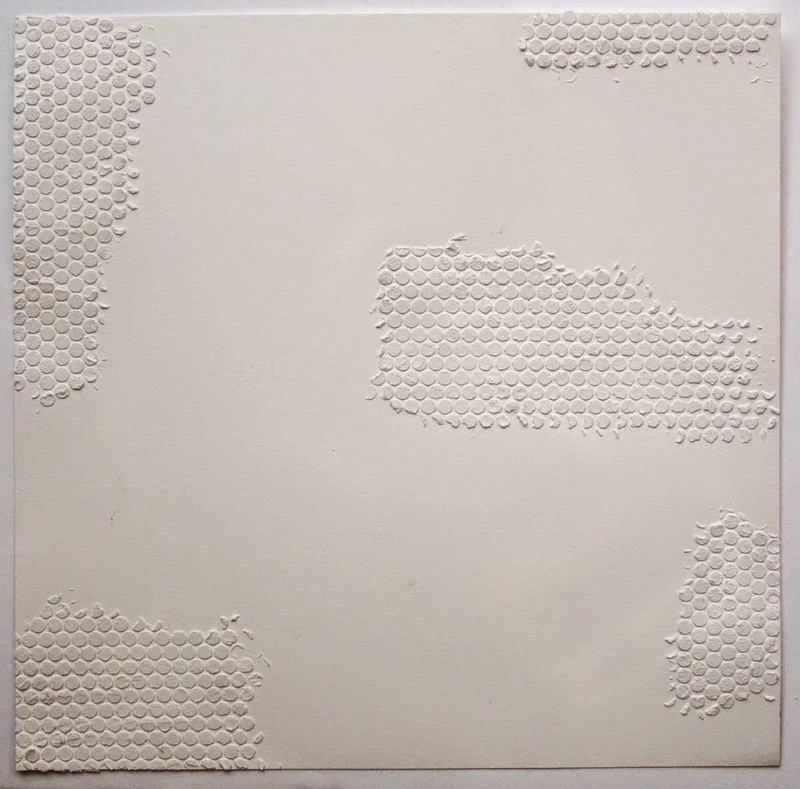 I've recently come across a YouTube video link in the Kraafter's Kommunity on G+ featuring a tutorial on 4X4 inch art tiles. I became hooked immediately! 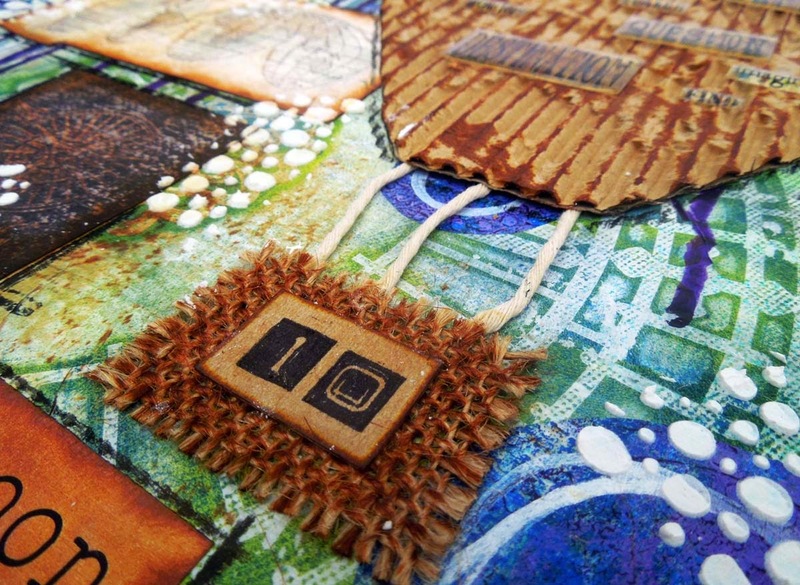 Art tiles (cards) are larger than ATCs and square shaped. 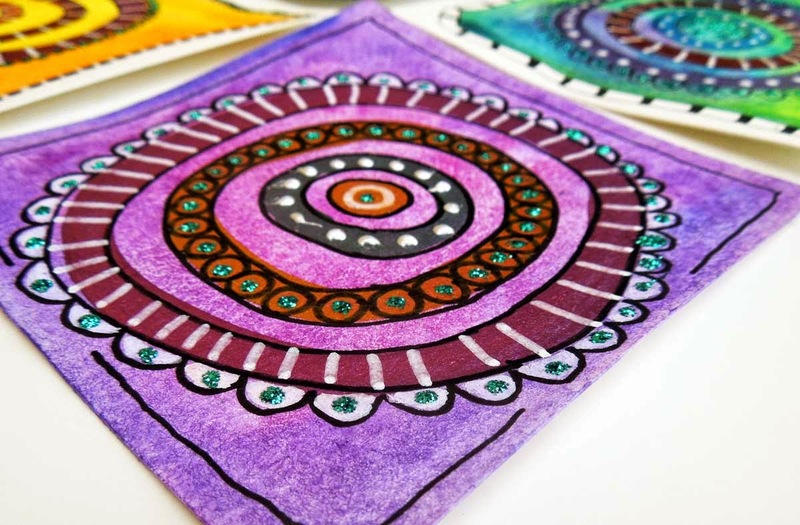 They are the perfect platform to explore colours and patterns. You can also add a little bling if you like! You can find the original YouTube video here. I started out by trimming an A4 sheet of good quality watercolour paper to 4X4 inch size squares. 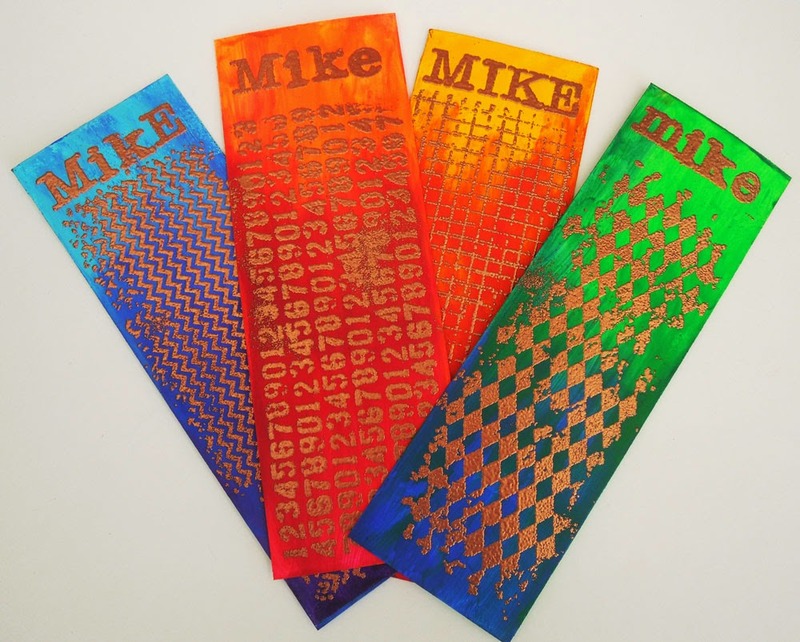 An A4 sheet makes fours squares and leaves you with a scrap strip large enough for creating some tags later. My favourite watercolour paper is Daler Rowney's Aquafine - I always get better results with these for some reason. 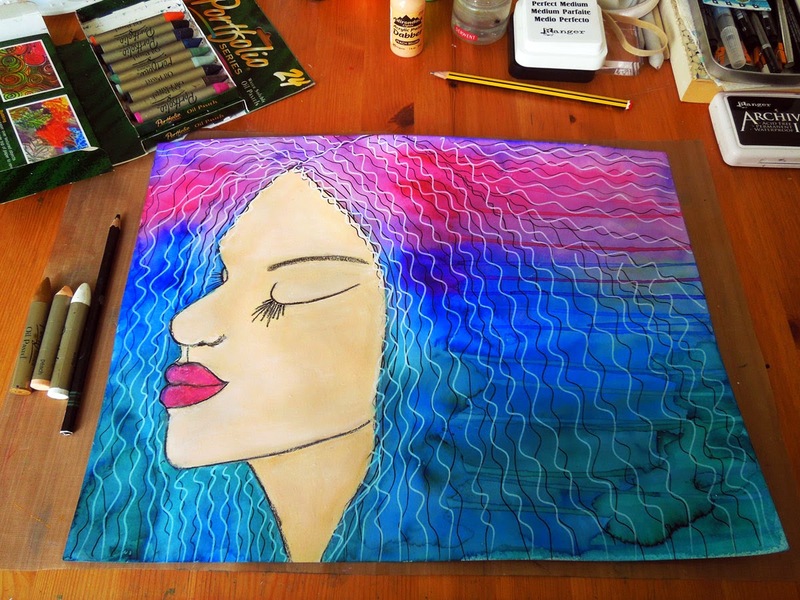 I then coloured the background using Derwent Inktense blocks, but any good quality watercolour paint or ink will do. 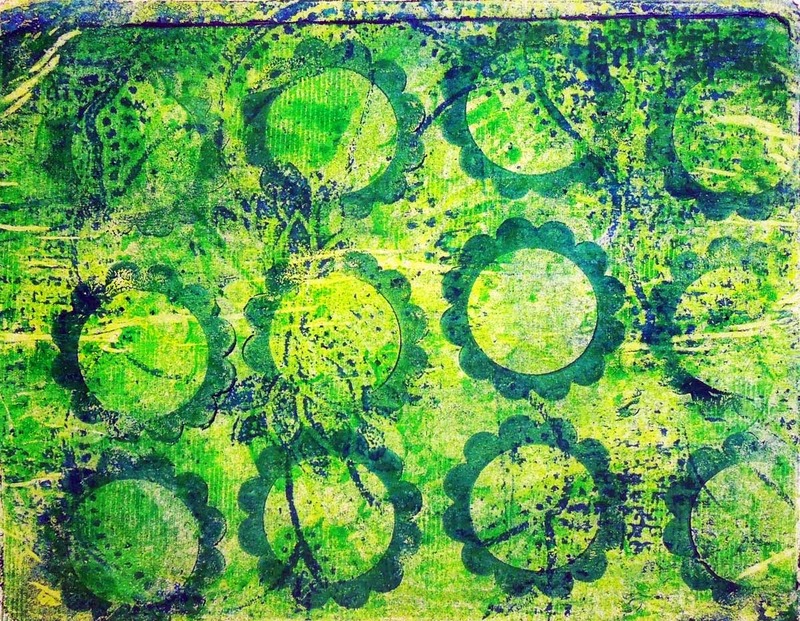 Choose 2 or 3 coordinating colours to create a blended background. I really enjoyed mingling the pigments until they were perfectly blended. 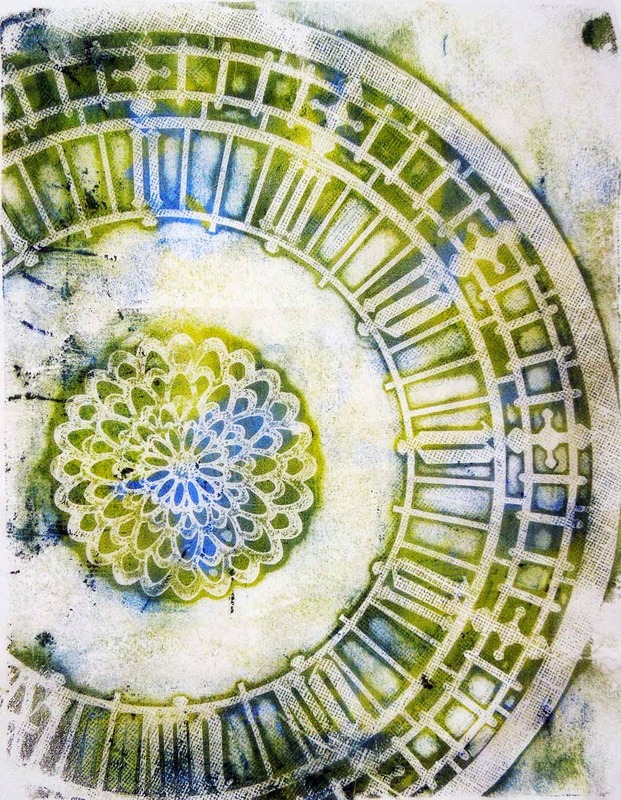 Once the background layer was dry, I painted some circles with mica powder. The lady in the video uses twinkling H2O's but mica powder works just as well. Mica powder is the same as Ranger's Perfect Pearls and usually comes in little screw top containers. Mine is an unbranded product, which I picked up on eBay, but it works beautifully. If you buy mica powder, make sure it's got a binder already added. 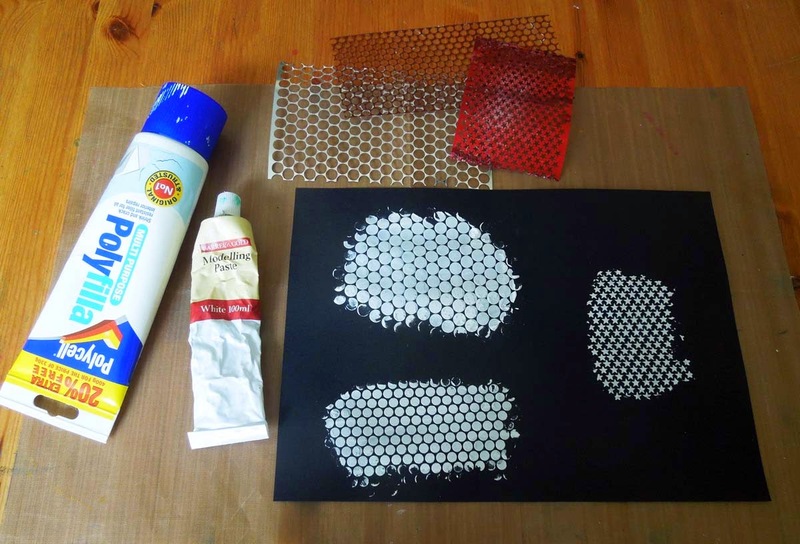 This makes it possible to use the powder as a paint by adding a small amount of water. It has a shiny metallic finish when dry. It really is very eye-catching! 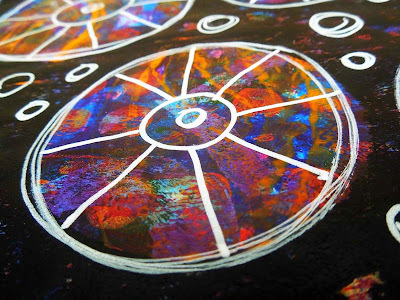 Next, I doodled borders and patterns on my circles with black and white Uni Posca paint markers. The Posca markers had no problem at all writing over the shiny surfaces. PC-1M is a good size for doodling, or choose PC-3M if you prefer a slightly thicker line. Finally, I added some glittery accents by applying Stickles glitter glue by Rangers. I only had the colour Aqua available when I worked on this project, but I'm getting some more colours soon! 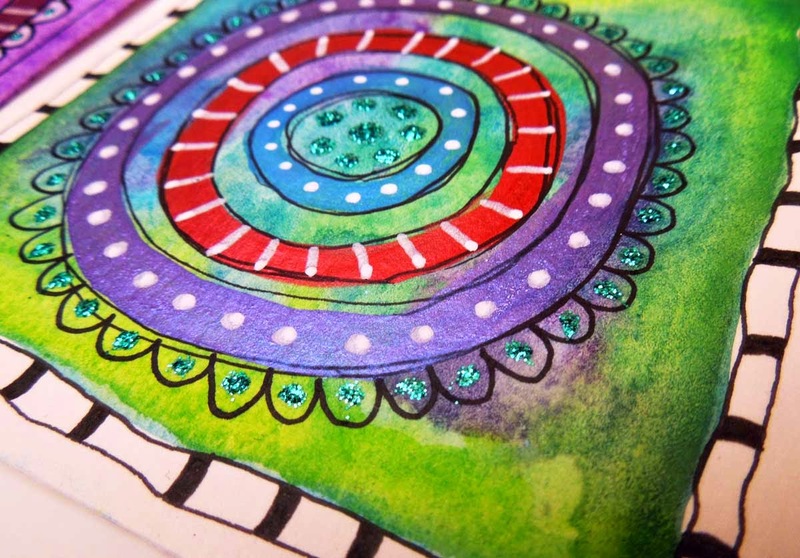 I love how just tiny dots of this glitter glue can make your project sparkle in the light! You can add as much or as little bling as you want. I've also tried adding Liquid Pears, but I prefer the look of Stickles. The photos don't really show how nice and shiny these card are, but both the mica powder and the glitter glue reflect the light beautifully, making them look almost magical! Best of all, anybody can do these! 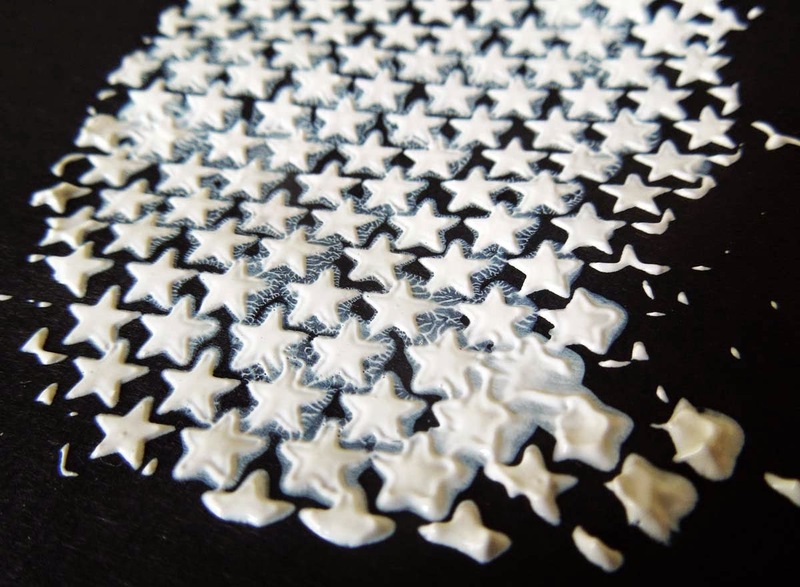 No special talent is required, so give it a go and be amazed at how beautiful simple patterns can look! I sure will be creating some more of these in the future! Thanks, Sheri, for the inspiration! 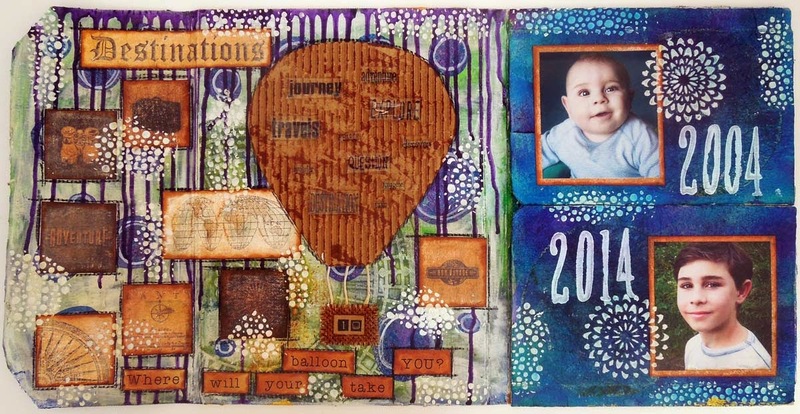 My creative journey (some might say "addiction") first started with scrapbooking. However, a few years ago I went digital and I can't even remember the last time I created a physical layout. The Kraaft Shaak's latest challenge provided me with the perfect opportunity to return to my scrapbooking roots. 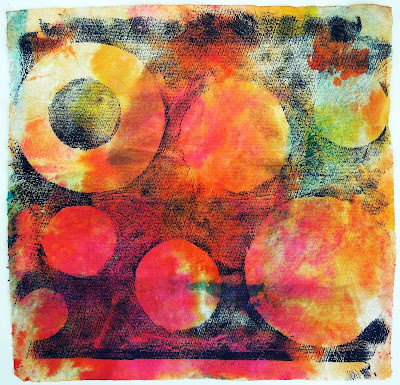 The challenge asks participants to use mixed media techniques in a way they haven't used before. Traditionally, my scrapbooking layouts (even the digital ones) used to be clean and simple. Perhaps even a bit boring. 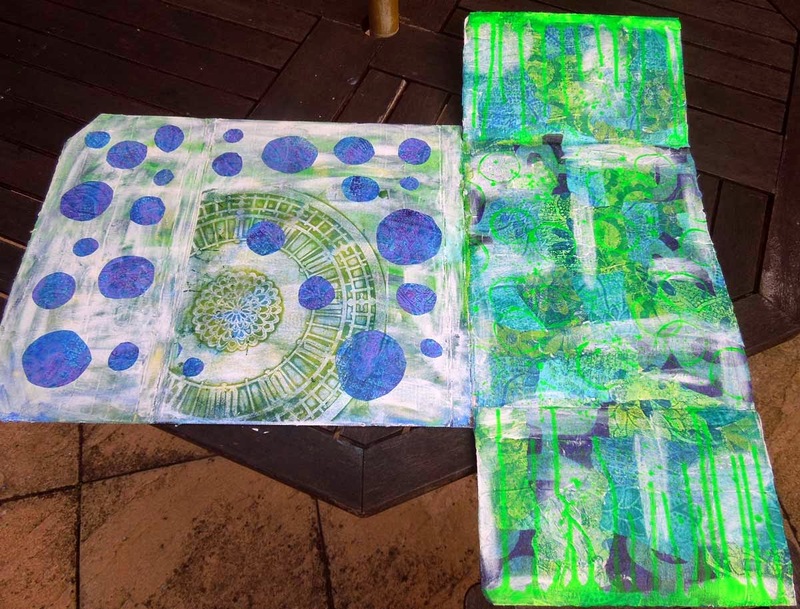 Having recently discovered mixed media techniques, however, I've come to enjoy getting my hands (and everything else) really messy. 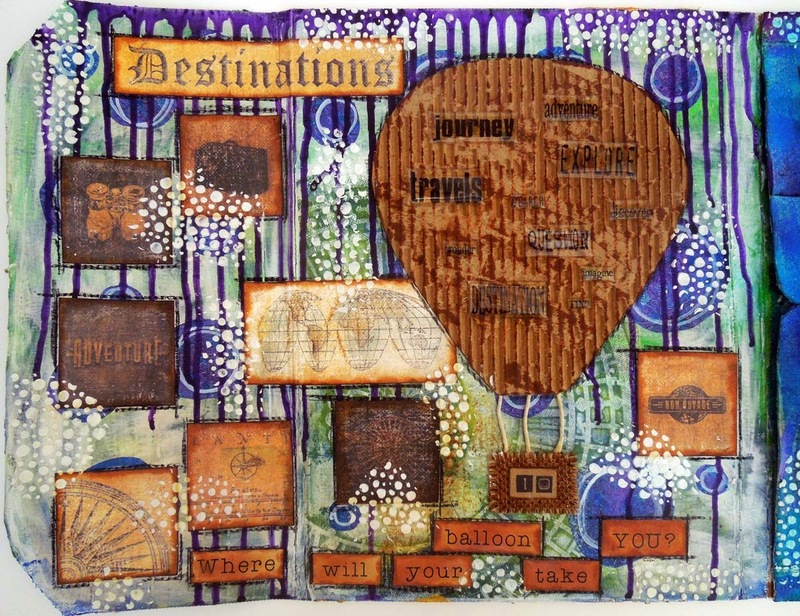 I've discovered ink, paint and texture paste and all kinds of creative techniques, which I haven't used in scrapbooking before . Armed with my newly acquired tools and materials I've set out to create my very first mixed media scrapbooking layout to meet the challenge! The title of my layout is 'Fly' and it comes with a quote "If you love someone set them free". It features my soon-to-be-ten-year-old son, who's getting more and more independent. I find it scary to think that one day, sooner than I realize, he will fly the nest and make his own way in the world. I want him to know that when the time comes, he's free to go wherever his dreams may take him - I will not put him in a figurative cage! I started by trimming a large sheet of watercolour paper to the traditional 12" X 12" scrapbooking size. 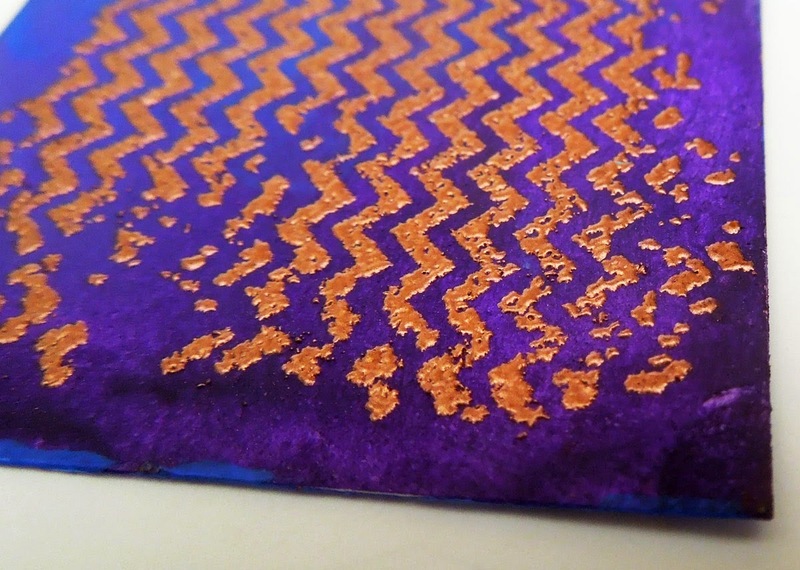 I then added texture paste over a piece of sequin waste to create a 3 dimensional surface in various places on the sheet. Actually, instead of texture paste, I used a polyfiller available from DIY stores (or in my case, my hubby's secret stash in the garage!). This is not only cheaper, but much better than what I used before. It dries real quick and doesn't dissolve when I apply water to my project (which has happened to my modelling paste!). 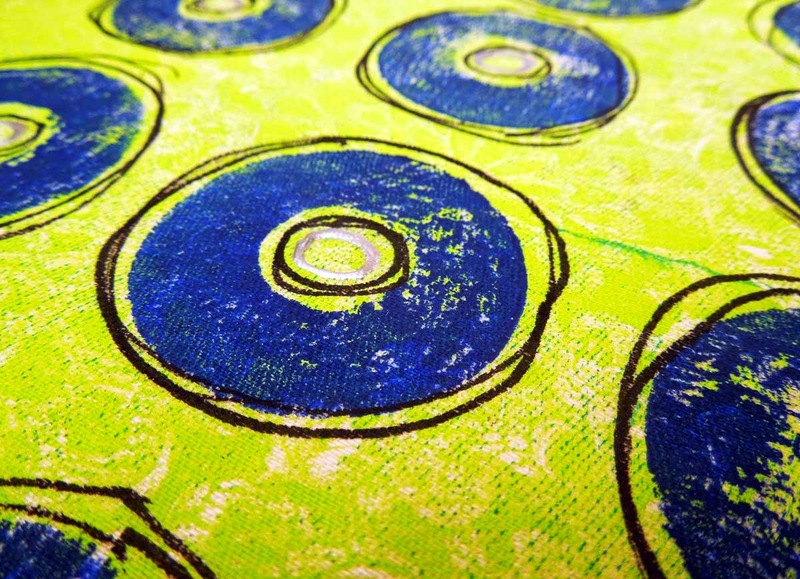 Next, I added Dylusions inks in Vibrant Turquoise and London Blue. 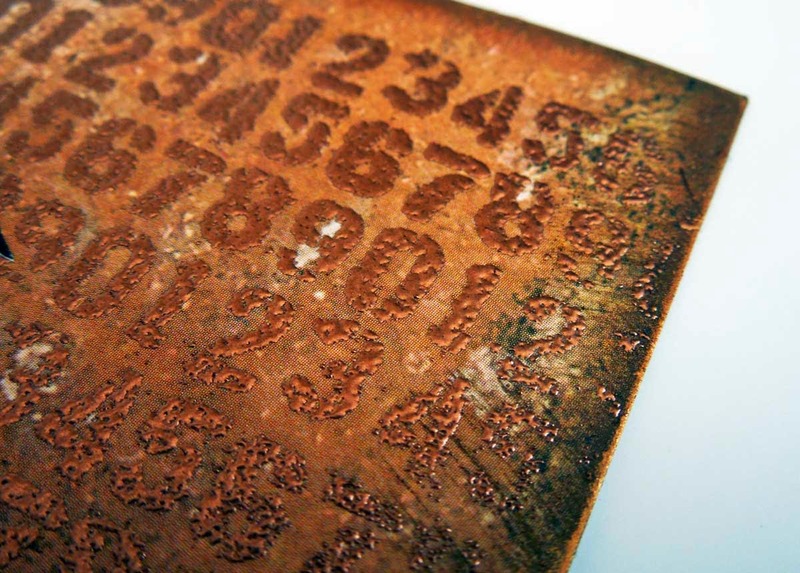 I also added a bit of burnt sienna watercolour paint to create a more distressed/rusted effect. I used to think of burnt sienna, as just a shade of ugly brown, until I realized what it does when mixed with other colours! I used a water mini mister to facilitate the blending of the inks. I played around with this for a while, then I set it aside to dry. 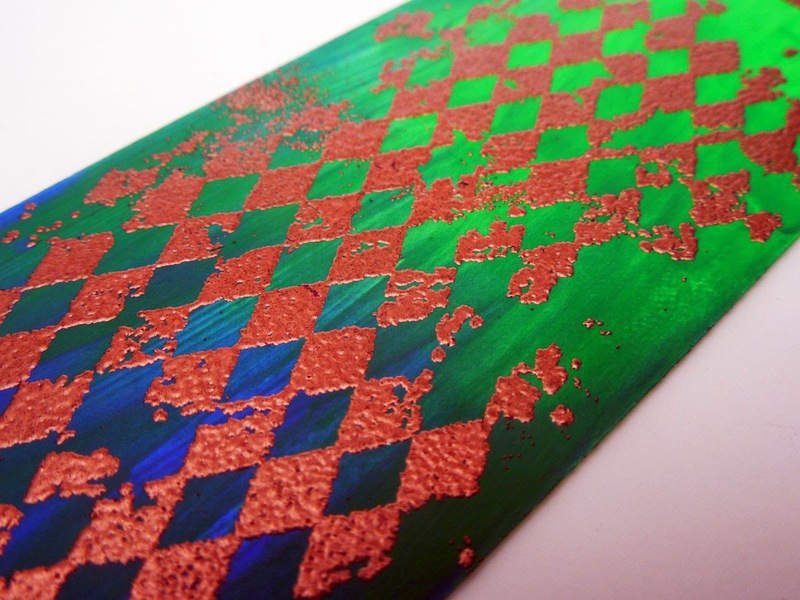 Next, I heat embossed parts of the texture using copper embossing powder. 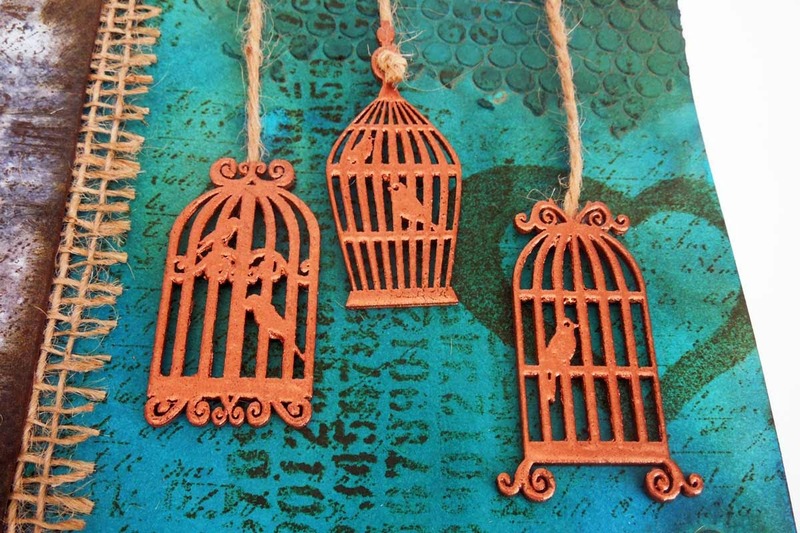 I used the same powder to emboss the three wooden bird cages, which I hung from the top of the page with jute and fastened with mini clothes pegs. 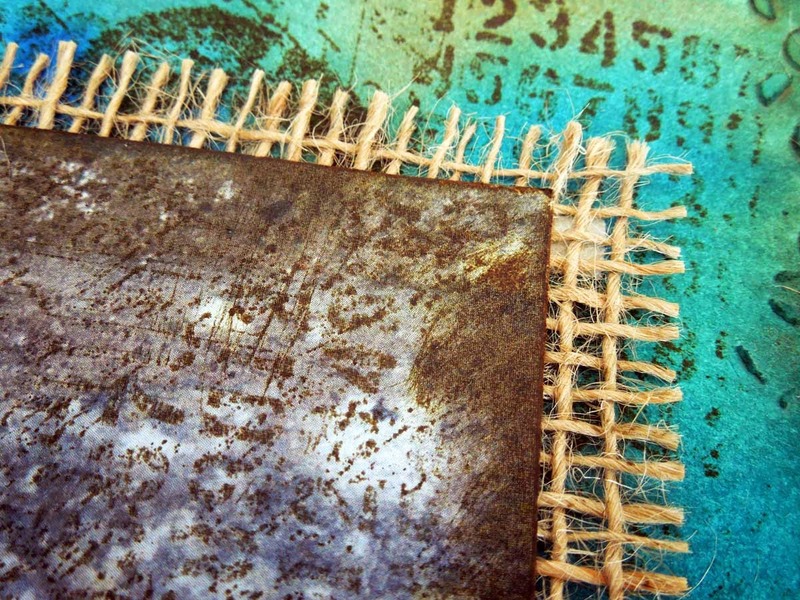 Jute is the same material that burlap is made from, which I used as a mat for my photo. I also added some stamping to the background. I used Kaisercraft's numbers and script backgound stamps and my home-made heart foam stamp. 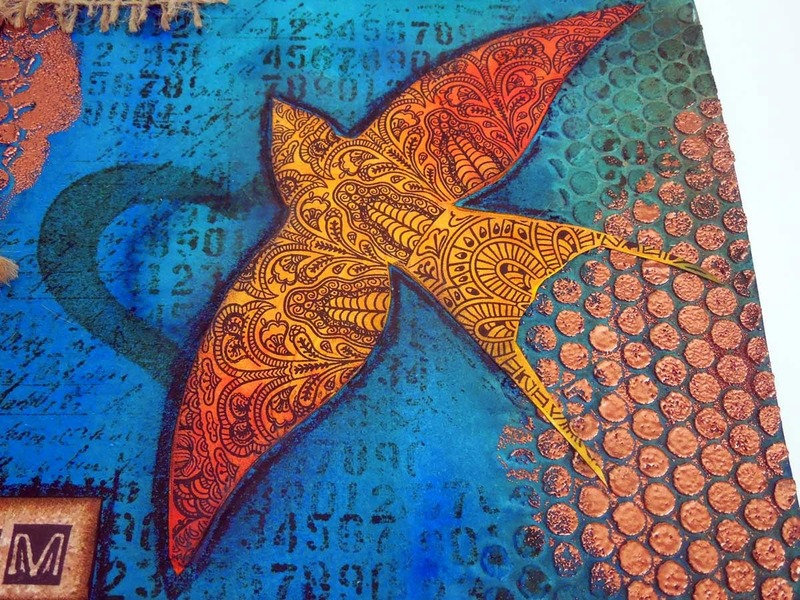 I cut out the bird motif from a napkin, which I mounted on a piece of medium-weight cardstock and sprayed with Dylusions Pure Sunshine and Tangarine Dream inks. 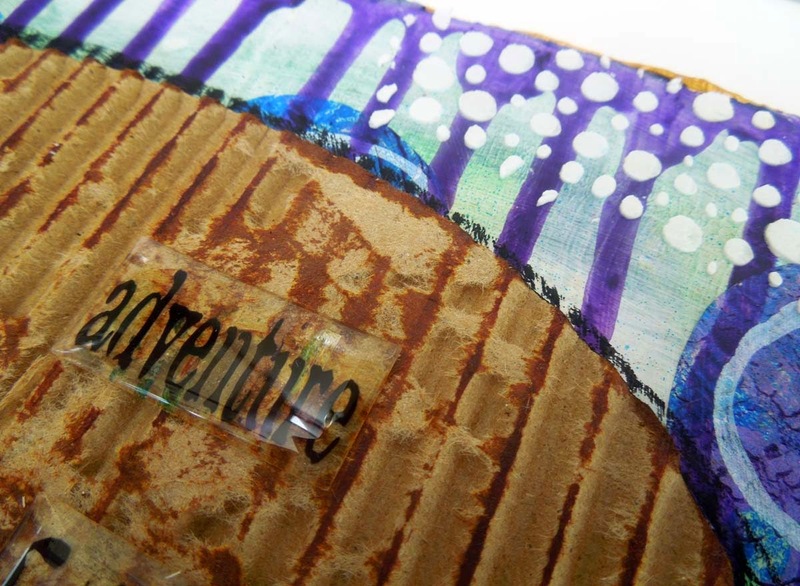 I stamped the title on a piece of scrapbooking paper which I then cut into word strips and inked the edges. 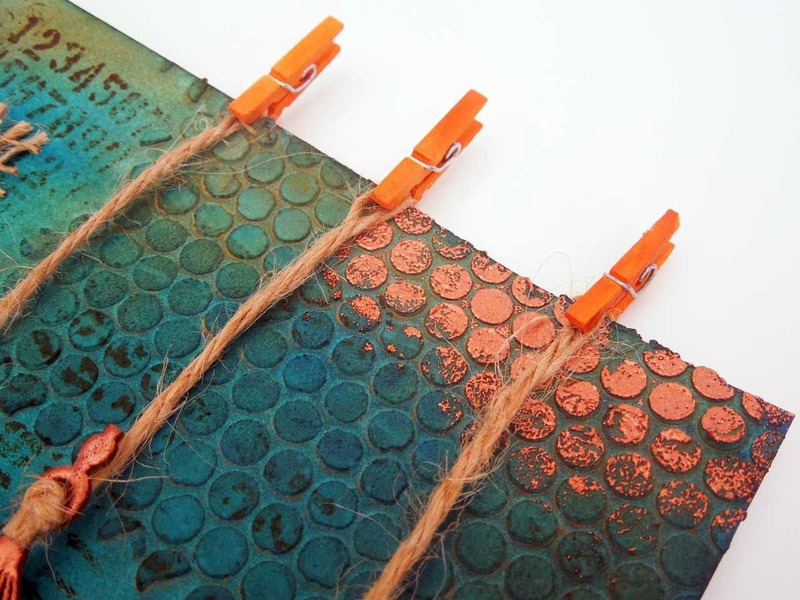 I made a tag from the same paper, and tucked it behind the photo with some hidden journaling on the back and copper embossing on the front. The key charm came from eBay. That's it, really! Enjoy the pictures!